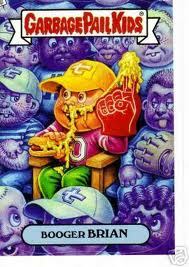 Who didn't love Garbage Pail Kids, even if you were outwardly too cool for them? It was awesome to find your own name (Impaled Gail was as close as you were gonna get to my spelling). If you had a common name, like Brian's, you might get a choice of cards (Booger Brian, Fryin' Brian, Brainy Brian.) Better than that was if you had an enemy, and you found THEIR card, especially if it was a really negative one (Nasty Nancy!). I was a little old for GPKs when they came out, but I always loved Wacky Packs and Mad Magazine, and really, this was just another jaunt down that road of goofy gross-out parodies. Topps is now releasing Flashback sets, so you can trip down memory lane with such cards as Rappin' Ron (a Ron Reagan lookalike) and Have a Nice Dave (yellow smiley face dude). They even had a cartoon.